Some athletes have left an indelible mark – they are so spectacularly talented it simply boggles the mind. Michael Jordan comes to mind. I was lucky enough to have watched him play at the United Center in Chicago some years ago. He was mesmerizing. And I’m just old enough to remember Walter Payton running across the field for a touchdown, like art in motion. . . the same as watching Michael Phelps swim, or Shalane Flanagan’s stride. The examples are endless, but what is it that makes these athletes successful? The magic question. It would be easy enough to blame it on genetics, but I would offer up Misty Copeland – the first African American woman to be named principal dancer with the legendary American Ballet Theatre. Whatever your ballet stereotypes, Copeland probably doesn’t fit them. She’s been told she shouldn’t wear a tutu – she doesn’t have the right legs, her muscles are too big. He is the only athlete to win the 5,000 and 10,000 meter races, as well as the marathon (a race he had never run) in one Olympic Games. What many of our favorite athletes have in common is that they were unlikely candidates for their sport. They move funny, have unorthodox body types, suffered devastating setbacks, started their sport late in life. . . or didn’t burn out despite starting too early. We all have more in common than we thought. I hold my elbows too far out when I run. It probably makes me slower. Maybe you kick one leg out at the back of your stride, over-pronate, or carry your hips off-center. Does it matter? If we review the most unorthodox athletes of all time and consider their accomplishments, I would have to suggest the answer is no, it doesn’t matter. Does it cause injuries? Maybe. My first real issue was that my toes went numb when I ran. My husband and I tried everything – larger shoes, different socks, orthopedic inserts. Once we figured out the problem was Morton’s Neuroma, I was on a mission to discover a fix, which turned out to be as simple as taking one vitamin B-12 each day – for ten years and counting. Whatever the injury/pain/issue, the anatomy behind the issue became as fascinating to me as the running itself. Runners have hundreds of issues in common. We have a propensity for pulling the same muscles: the quad, hamstring and/or calf muscles. Then there are those dreaded black toenails (cut them short!). Muscles that are the most prone to cramps are those that cross two joints. A weakened Tensor Fascia Latae can tug on the knee and vice versa. Gentle stretching may help the sore Achilles’ tendon and an out of sorts Plantar Fasciitis, but does very little to loosen a tightened ITB. If you have knee problems, it might be wise to strengthen the hip. A sore back? Strengthen the abs. Every athlete is different. Our execution varies from one to the other. What works for me may not work for you, and vice versa. One thing is certain, however, the anatomy behind our running that can (and eventually will) affect our running is shared by us all, and it spans from our brains to our little toe. A better understanding of our anatomy may be the secret sauce in the never-ending quest to remain injury free – something else we all have in common, whether you’re a runner, walker, dancer, gardener, or mom lifting baby. Next up: The Anatomy of a Runner: it’s all about that bass. Does Running Cause Knee Problems and Eventual Arthritis? A couple of weeks ago in class we debated whether running causes knee problems. Everyone seems to believe if you run for too many years, you will eventually have bad knees, arthritis or both. Approximately one third of serious runners will incur an injury in a given year, and approximately one third of the injuries will involve the knee. Biomechanical studies on running reveal the tremendous cyclic forces to which the knee is subjected and show that forces of up to 300% body weight can occur even during normal walking, and this may rise to 550% during running. I read a fascinating study that measured the changes in the cartilage volumes in the tibia, patella and medial and lateral meniscus (the cartilaginous tissues that provide structural integrity to the knee) after the extreme dynamic loading that occurs in long-distance runners. It also examined the rate of recovery from the alterations occurring at the knee joint due to loading during distance running. 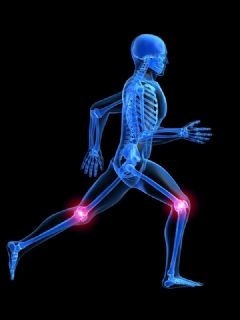 In short, although there were significant changes after a 5, 10 and 20 km run, the conclusion on the basis of the study was that the cartilage is able to adapt well to the loads caused by running and that the articular structures were found to recover rapidly so that exercise could be continued after a short rest without reservation. Our bodies seem to have been designed to withstand the pressure of running. The affected tissue is not only adaptable but regenerative, rebuilding itself within a short period of time. This study revealed that after 1 hour of rest no significant reduction of cartilage volume was measured for the patella, the tibia or the lateral and medial meniscus. The best evidence that running does not lead to pain and eventual arthritis comes from an ongoing study of the Fifty Plus Runners Association. The study was launched in 1984 when all the runners were at least 50, and updated every five years or so since. Many of the runners are now in their 60s, 70s, or older. The newest update to this study was published last September in Arthritis Research & Therapy. It compared the runners, who averaged about 26 miles a week, to a matched set of controls, who averaged about two miles a week. The study’s major conclusion: The runners experienced “about 25 percent less musculoskeletal pain” than the control group. That’s a major check mark in my book for staying active. Runners will eventually get injured. The most enjoyable reading I found on the topic came from Paul Ingraham, a science writer and runner who suffered from a severe case of ITBS and subsequently studied knee injuries for several years. He identifies two common “runner’s knee” conditions: pain on the side (iliotibial band syndrome, or ITBS), pain on the front (patellofemoral pain syndrome, or PFPS) and provides a checklist of symptoms to help you identify the cause of your pain. It’s fun and informative reading. Every source seems to agree on several things we can do to help prevent long term damage to our knees due to injury and/or prevent the onset of osteoarthritis regardless of our chosen sport (ITBS in particular also affects cyclists and hikers). Avoid Carrying Extra Weight: Increased body weight, which adds stress to lower body joints, is a well established factor in the development of osteoarthritis. Your knees, which carry the brunt of your weight, are particularly at risk. For every pound you gain, you add 4 pounds of pressure on your knees and six times the pressure on your hips. Recent research suggests that excess body fat produces chemicals that travel throughout the body and cause joint damage, which would mean obesity plays a systemic, not just a mechanical, role in osteoarthritis onset. Avoid Overuse/Injury: While running itself doesn’t increase the risk of osteoarthritis, running injuries can–especially when you delay treatment or rush recovery. If an injury is not properly cared for, the non-healing of it can cause the degenerative process of arthritis to start in the joints. Train smart: don’t ramp up too quickly, don’t train if you’re Injured. Be Strong: Studies show that weakness of the muscles surrounding the knee is associated with osteoarthritis, especially in women, and makes the pain and stiffness worse after onset. Strengthening exercises for thigh muscles are important in reducing the risk.